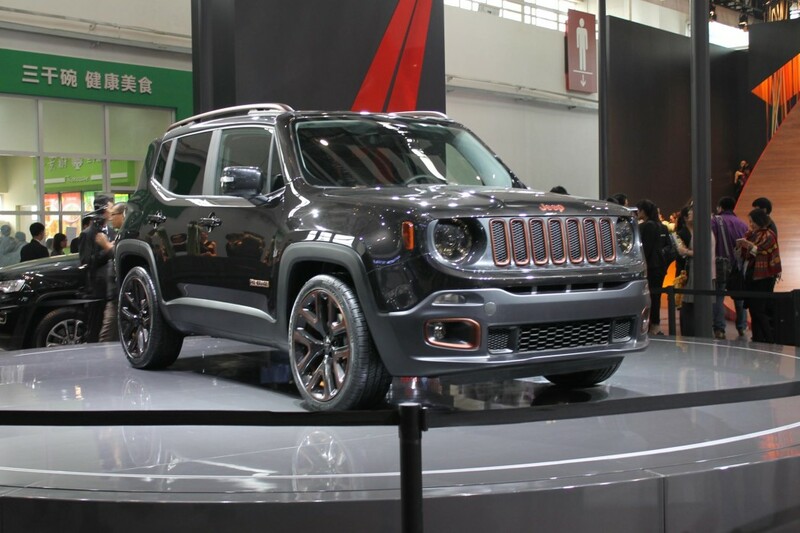 Following its world premiere appearances at the 2014 Geneva and New York auto shows, the all-new Jeep Renegade now debuts as a special design concept in Beijing. Zi You Xia, which means "rebel", is a new concept that highlights a more sophisticated aspect of the Renegade's personality. Inspired by the colors of the National Centre for the Performing Arts in Beijing, the concept is finished in a Warm Chocolate Gray with a contrasting Dark Anodized Bronze color accentuating the grille throats, front fog lamp bezels, rear lower fascia, skidplate, tail lamp insert bezel and badging. The roof panel, grille surrounds and door mirror caps are painted a Dark Charcoal to provide harmonious accents and a more premium appearance throughout. Unique 20-inch, Dark Anodized Bronze alloy wheels contribute additional visual flair as well as hinting at the vehicle's outstanding on-road and off-road driving dynamics. The interior of the concept boasts an energetic ambience with rugged and functional details crafted in high quality materials. The Piano Black color is accompanied by grey A-pillars and headliner. The air vents, speaker bezel, gear shifter, steering wheel bezels, cup holder and door release handles are finished in an Anodized Copper, reflecting the metallic color common in sports equipment. The rich brown leather upholstery on the seats and door panels feature 'ombre' grey/black plaid fabric inserts, that were inspired by traditional menswear suiting and tailored patterns, adding just the right touch of sophistication to the sporty Zi You Xia. True to the Jeep brand's heritage, the all-new Renegade is the most capable small SUV and the first in the world to offer a nine-speed automatic transmission. Designed for global markets and manufactured with up to 16 powertrain combinations - the most ever in a Jeep vehicle - it has been engineered to meet the specific requirements of customers all around the world.